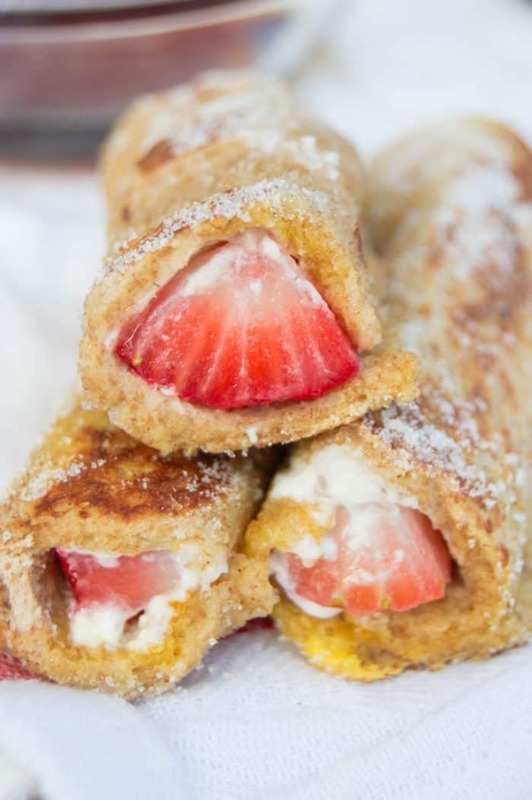 Sweet fruit rolled with cream cheese and cooked like French Toast. 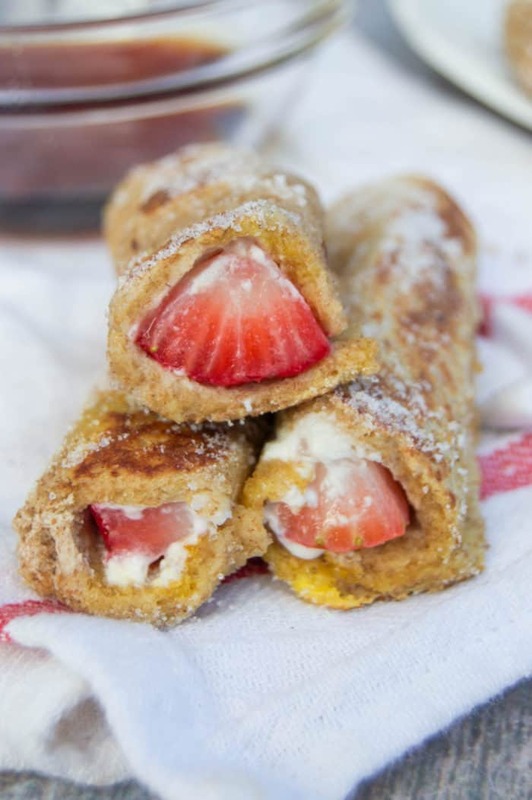 I love these simple and sweet Strawberry French Toast Roll Ups, and they are a huge hit for breakfast! Breakfast recipes are my favorite, but early mornings are my least favorite. Simple breakfast are a must because who wants to get up extra early to cook? Not me! 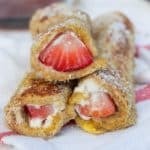 I made Strawberry French Toast Roll Ups for the kids and I for breakfast last week, and we ended up making more for lunch! They absolutely love them and they are so easy to put together. Plus you probably have all the ingredients in your pantry already! No using any fancy bread for this recipe, just good ol’ sliced sandwich bread works perfectly. You just want to make sure that your bread is soft and will roll easily. First cut off the crust to your bread, and if your a mom like me then you are an expert at that ;). Then use a rolling pin to flatten out your bread. You will use one piece of bread for each roll-up, my kids can generally eat 2-3 for breakfast (I’m a mom to two growing boys). Since you are using soft bread I used whipped cream cheese to help not tear the bread when spreading it on. Last line up a few thinly sliced strawberries and roll. I cooked them like I would any french toast, dipped in an egg wash and then cooked on a skillet. Last I rolled them in a cinnamon and sugar mix. 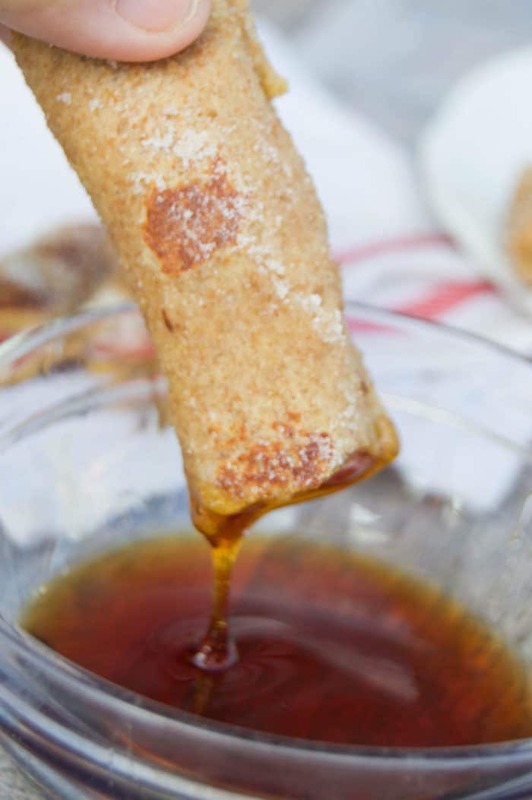 These things taste great as is, but if you need a little more sugar (like we did) then you can serve them with a side of syrup for dipping. Spread a tsp of cream cheese onto a slice of bread and line the edge with sliced strawberries. Roll and seal bread. Gently roll in egg mix and let any excess run off. Place in the warm skillet with the seal down. Allow to cook for a few minutes turning to get each side cooked.